For as long as there's been any kind of smart watch, any 'wearable' electronic devices, it's been rumored that Apple would jump into the category with a wearable of their own. They did just that in September of 2014, at an event that also saw the introductions of the iPhone 6 and 6 Plus, and Apple Pay. It was also the event that included the much-maligned announcement of a free new album from U2. Other than perhaps the iPad, the Apple Watch was rumored for the longest of any Apple product this century. Even the iPhone wasn't as long anticipated: for at least three years, the rumor mill kept churning out suggestions that Apple had a watch in the works. In reality, the project began with Jony Ive shortly after Steve Jobs's death in October 2011. Speaking in 2014 to Hodinkee, a magazine for watch enthusiasts, Ive said that he didn't remember ever talking with Jobs about the topic. Additionally, Jobs had never expressed any interest in the concept, either. "The process was both typical and atypical for us," said Ive. "We are a tight-knit group of designers, and as always, these things start with an idea that quickly becomes a conversation that changes in nature as soon as you start to draw and make physical objects. Things are exceptionally fragile as an idea - entirely abstract - but once there is an object between us, it is galvanizing." Ive began thinking of what would become the Apple Watch in late 2011 and the company worked on it throughout 2012. Then, according to 2015 article in Wired on the "secret history of the Apple Watch, Kevin Lynch was hired by Apple as vice president of technology in early 2013 to formally head up the Apple Watch project. There was just the proviso that he wasn't allowed to tell anyone what exactly he was working on. It took around 18 months from Lynch's hiring to when Tim Cook revealed the Watch using Steve Jobs's familiar phrase about having "one more thing" to announce. That phrase alone caused applause in the auditorium at the Flint Center in Cupertino. "We've been working incredibly hard, for a long time, on an entirely new product," Cook told the crowd. "And we believe this product will redefine what people expect from its category. I am so excited, and I am so proud, to share it with you this morning. It is the next chapter in Apple's story." Cook then introduced a video that first spanned the atmosphere of planet Earth, and then closeups of the sides and face of the Watch, and finally the full Apple Watch. The Watch would would pair with an iPhone, and also came with a heart-rate sensor. The product actually got a standing ovation, something of a rarity at Apple keynotes. Cook went on to describe the Apple Watch as "the most personal device we've ever created. We set out to make the best watch in the world, one that is precise. It's synchornized with a universal time standard and it's accurate within plus or minus 50 milliseconds. It's incredibly customizable, so you can find one that reflects your personal style and taste. Because you wear it, we invented new, intimate ways to connect and communicate." While the announcement and so very much awaited reveal of the Apple Watch was on September 9, 2014, the device itself wouldn't actually ship for another eight months. Even then it was only available online: on April 24, 2015, if you were very quick, you could order one starting at $349. The Watch wasn't available in Apple Stores until the June of the year. Wherever you bought it, that first version was released in three models: Apple Watch, Apple Watch Sport and Apple Watch Edition. While the base model began at $349, the Edition version could see you spending in excess of $10,000. It was the same Watch at each price point but the case materials ranged from aluminium through steel and on to gold. While there was an impression in the product's first year or so that the Apple Watch was being greeted tepidly, it quickly emerged as the most popular smartwatch on the market. In our April 2015 review, AppleInsider called the first Apple Watch "beautiful, but rough around the edges," ranking it 3.5 stars out of 5. "We don't regret buying one. Nor do we regret buying the original iPad, iPad 2 or iPad 3," we wrote. "We're early adopters, and in general really like Apple products. 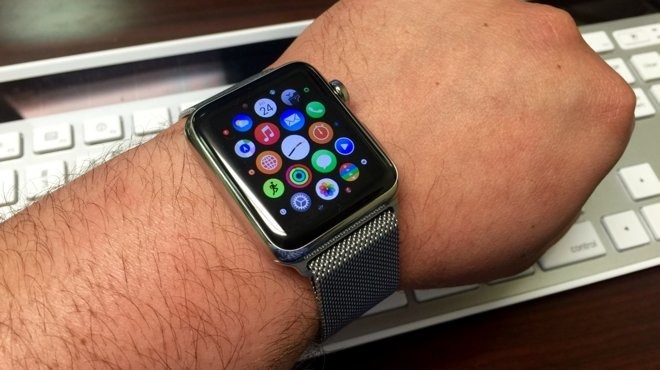 We believe the Apple Watch has huge potential, and very real benefits right now. But if the decision is to buy a Watch now or wait until the next generation, and you're not the typical early adopter, maybe you should wait. Or at the very least, buy the cheapest Sport model you can." The second Apple Watch generation was announced on September 7, 2016, at an Apple keynote that also saw the debuts of the iPhone 7 and iPhone 7 Plus, as well as AirPods. It didn't look significantly different from the first Watch, but the big changes in what was called Apple Watch Series 2 included the addition of GPS, a brighter display, and improved water resistance, upgrading from "splash-proof" to "swim-proof." It also upgraded the OS to watchOS 3, and upgraded to a dual-core S2 processor. "We're thrilled with the response to Apple Watch and how it's changed people's lives. 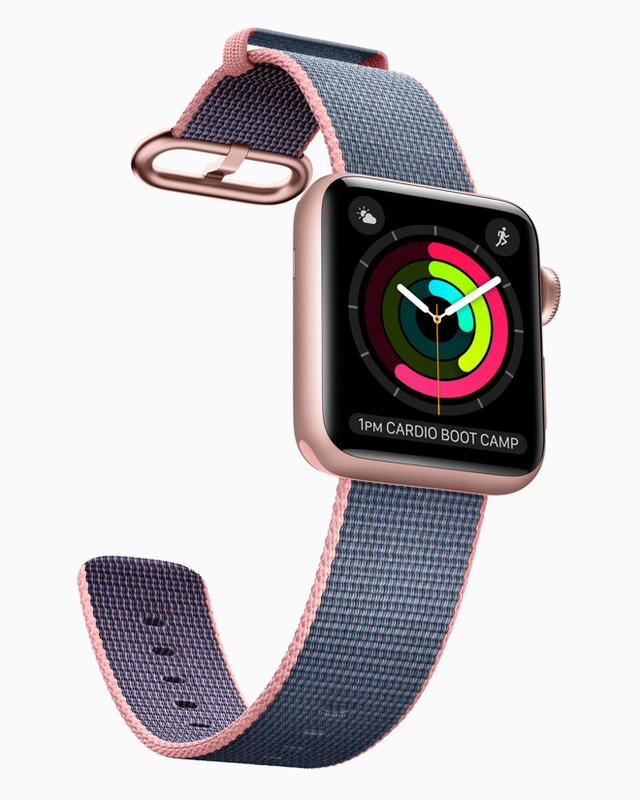 We are committed to fitness and health and think our customers will love the new capabilities of Apple Watch Series 2," Jeff Williams, Apple's chief operating officer, said in the announcement. "With a powerful new dual-core processor, water resistance 50 meters and built-in GPS, Apple Watch Series 2 is packed with features to help our customers live a healthy life." The Series 2 started at $369 at launch. The first Apple Watch was re-launched as Apple Watch Series 1, now priced at $269. It wasn't the original device with a lower price, however. Unofficially, the original Watch began to be referred to as Series 0 and it was discontinued at this 2015 event. The Series 1 was really more like the Series 2 with elements such as GPS missing. In our review, published that month, AppleInsider gave the Series 2 4 stars out of 5 and called the Watch "a great improvement." "Apple Watch Series 2 is worth your consideration. We wouldn't recommend waiting around for potential features. What it does now —fitness tracking and notifications on your wrist —it does well. Don't worry about what the future brings. Buy with confidence." The third version of the Apple Watch arrived a year later, at the first keynote to be held inthe new Steve Jobs Theater, on September 12, 2017. It joined the iPhone X, the iPhone 8 and 8 Plus, and Apple TV 4K as that event's announcements. In introducing the latest Watch, Tim Cook revealed that Apple Watch overtaken Rolex by that time to become the #1 watch in the world. The headline improvement for Series 3 was the addition, for the first time, of LTE cellular connectivity. It upgraded to a dual-core Apple S3 processor and watchOS 4. "We believe the addition of cellular will transform the way people use Apple Watch, providing a new sense of freedom since they can stay connected with or without their iPhone," Jeff Williams said in the press release. "Apple Watch Series 3 combined with the power of watchOS 4 is the ultimate device for a healthy life." The Series 3 was released for $329 for the regular model, and $399 for the edition with cellular capability. To use the cellular features required a monthly fee which varied between providers but was typically $10. Then, especially internationally, not all cell companies supported it at all. While the Series 2 was discontinued, Apple continued selling the Series 1. In our review, AppleInsider raved about the Series 3, rating it 4.5 stars out of 5. "Apple Watch Series 3 with cellular takes a major step forward in making Apple's wrist-worn device its own independent, connected computing platform. Simply put, it's a must-have for athletes in the Apple ecosystem, and a wearable device worth considering for many other non-fitness use cases." Apple is expected to launch an Apple Watch Series 4 at its "Gather Round" event on September 12. It is believed to mark the first significant hardware difference since the original Watch with what is expected to be a greater display area, with a higher resolution on the face and a slimmer casing. But, obviously, this chapter has yet to be fully told. Apple Watch can only be looked upon as a great success. It's the most popular smartwatch and wearable electronics product in the world, and at least last year, it was the most popular watch in the world. As of mid-2018, Apple's wearables division was estimated as large enough to comprise a Fortune 300 company. While Apple does not break out Apple Watch sales, the Apple Watch Series 1 was the top smart watch in the world in Q2 2018, with the Series 3 ranked fourth. The Watch has significantly grown the smartwatch category, and changed the definition of the word "Watch." And perhaps most significantly, it's saved several lives, with at least a half-dozen news stories in 2018 stating that the Watch's heart rate monitor has alerted them to medical emergences. Steve Jobs may not have cared all that much about watches, but the Apple Watch showed that Jobs' successor could create a new product category and make it a key part of Apple.